This is the best 3-piece urethane ball we’ve ever made. It features a DuraSpin Cover that’s more durable and produces both the soft feel and exceptional short-game spin that players seek from a high performance Tour golf ball. 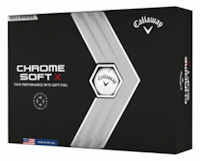 Chrome Soft also incorporates the best HEX Aerodynamics that Callaway has ever developed. Golfers with moderate swing speeds can take advantage of maximized ball speeds and penetrating ball flights for the ultimate performance. The s-Tech Core offers the optimal combination of low compression and high resilience for extremely soft feel off the clubface and exceptional ball speeds that maximize distance for players with moderate swings. Mantle Layer provides excellent resilience without making the ball feel harder and is designed to maximize ball speed without generating high spin off the tee. Callaway’s patented HEX Aerodynamics produce 100% surface area coverage for the best aerodynamic performance ever in a Callaway golf ball.